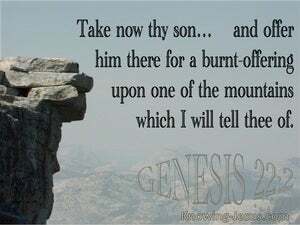 ﻿ Genesis 22:2 He said, "Take now your son, your only son, whom you love, Isaac, and go to the land of Moriah, and offer him there as a burnt offering on one of the mountains of which I will tell you." God said, "Please take your son, your unique son whom you love Isaac and go to the land of Moriah. Offer him as a burnt offering there on one of the mountains that I will point out to you." And he said, Take now thy son, thine only son, whom thou love, even Isaac, and get thee into the land of Moriah. And offer him there for a burnt offering upon one of the mountains which I will tell thee of. And he said, Take now thy son, thine only son, whom thou lovest, even Isaac, and get thee into the land of Moriah. And offer him there for a burnt-offering upon one of the mountains which I will tell thee of. And he said to him, Take your son, your dearly loved only son Isaac, and go to the land of Moriah and give him as a burned offering on one of the mountains of which I will give you knowledge. And he said, Take now thy son, thine only son Isaac, whom thou dost love, and go to the land of Moriah and offer him there for a burnt offering upon one of the mountains which I will tell thee of. And he will say, Take now thy son, thine only, whom thou didst love, Isaak, and go by thyself to the land of Moriah; and carry him there for a burnt offering upon one of the mountains of which I told thee. And he said, Take now your son, your only son Isaac, whom you love, and get you into the land of Moriah; and offer him there for a burnt offering upon one of the mountains which I will tell you of. And he said, "Take your son, your only child, Isaac, whom you love, and go to the land of Moriah, and offer him there as a burnt offering on one of the mountains where I will tell you." 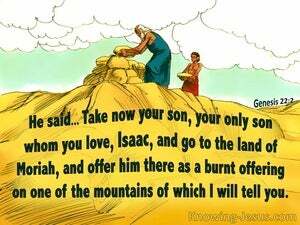 And He said, Take now your son, your only one, Isaac, whom you love. And go into the land of Moriah, and offer him there for a burnt offering upon one of the mountains which I will name to you. And he said, "Take thy only son Isaac whom thou lovest, and get thee unto the land of Moria, and sacrifice him there for a burnt offering upon one of the mountains which I will show thee." God said, "Take your son -- your only son, whom you love, Isaac -- and go to the land of Moriah! Offer him up there as a burnt offering on one of the mountains which I will indicate to you." He said, "Now take your son, your only son, whom you love, even Isaac, and go into the land of Moriah. Offer him there for a burnt offering on one of the mountains which I will tell you of." And he said, Take now thy son, thy only son Isaac, whom thou lovest, and go into the land of Moriah; and offer him there for a burnt-offering upon one of the mountains which I will name to thee. 1 Now it came about after these things, that God tested Abraham, and said to him, "Abraham!" And he said, "Here I am." 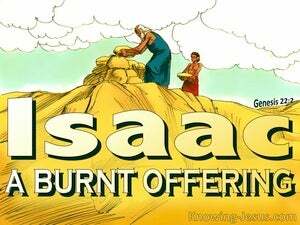 2 He said, "Take now your son, your only son, whom you love, Isaac, and go to the land of Moriah, and offer him there as a burnt offering on one of the mountains of which I will tell you." 3 So Abraham rose early in the morning and saddled his donkey, and took two of his young men with him and Isaac his son; and he split wood for the burnt offering, and arose and went to the place of which God had told him. Then he took his oldest son who was to reign in his place, and offered him as a burnt offering on the wall. And there came great wrath against Israel, and they departed from him and returned to their own land. Does the LORD take delight in thousands of rams, In ten thousand rivers of oil? Shall I present my firstborn for my rebellious acts, The fruit of my body for the sin of my soul?